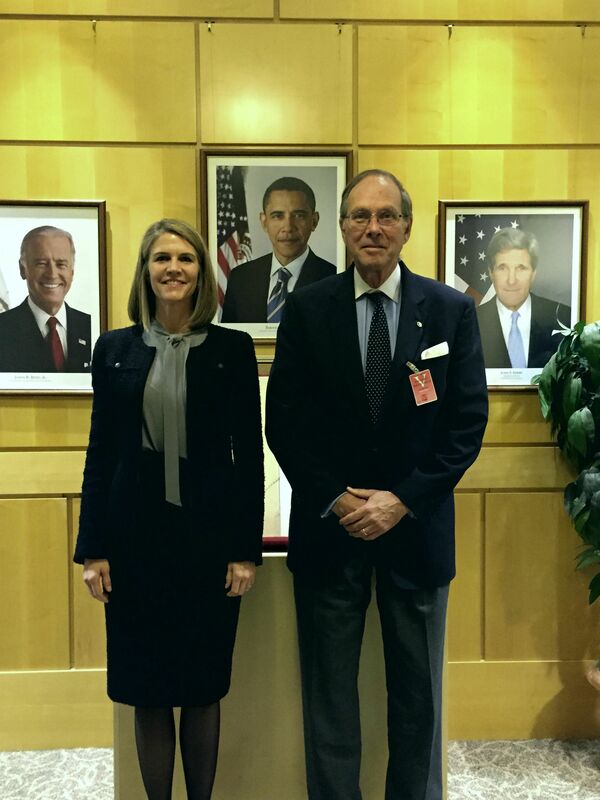 12/3/2015 - American Hungarian Federation has follow-up meeting with Ambassador Colleen Bell... During his stay in Budapest, Mr. Koszorus also met with United States Ambassador Colleen Bell. The purpose of the meeting wasto follow up on AHF’s November 4, 2015 letter toAmbassador Bell in whichAHF suggested that U.S. interests – promotion of democracy and human rights, strategic and economic -- may not always be served by public criticisms which are perceivedby the man-on-the-street in Hungary, whether a supporter of the government or not, to be demeaning and humiliating. The meeting also continued AHF’s constructive dialogue with Ambassador Bell regarding strengthening good U.S-Hungarian relations and the foundations of those relations. “Ambassador Bell was more than gracious and we explored various possible initiatives to advance better U.S./Hungarian relations, which is in the interest of both countries and certainly of great concern to AHF and the Hungarian American community,” reflected Mr. Koszorus. 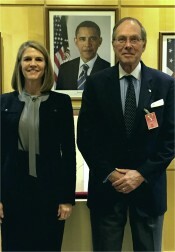 “Ambassador Bell effectively and with great poise represents the United States and pursues this important goal,” he concluded. 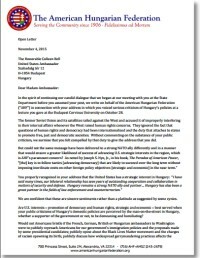 In the spirit of continuing our candid dialogue that we began at our meeting with you at the State Department before you assumed your post, we write on behalf of the American Hungarian Federation (“AHF”) in connection with your address in which you voiced serious criticism of Hungary’s policies at a lecture you gave at the Budapest Corvinus University on October 28. The former Soviet Union and its satellites railed against the West and accused it of improperly interfering in their internal affairs whenever the West raised human rights concerns. They ignored the fact that questions of human rights and democracy had been internationalized and the duty that attaches to states to promote free, just and democratic societies. Without commenting on the substance of your public criticism, we surmise that you felt compelled by that duty to give the address that you did. We are confident that these are sincere sentiments rather than a platitude as suggested by some cynics. Are U.S. interests – promotion of democracy and human rights, strategic and economic – best served when your public criticisms of Hungary’s domestic policies are perceived by the man-on-the-street in Hungary, whether a supporter of the government or not, to be demeaning and humiliating? Would not Americans bristle if the French, German, British or Hungarian ambassadors to Washington were to publicly reproach Americans for our government’s immigration policies and the proposals made by some presidential candidates; publicly opine about the Black Lives Matter movement and the charges of racism spawning its birth; publicly discuss how widespread gerrymandering practices affects the composition of our political party representation in numerous congressional districts; or publicly point to the lack of a single Republican vote in the Congress approving the Affordable Care Act? It, therefore, shouldn’t come as a surprise if critical public statements about Hungary’s policies humiliate and alienate many democratic-minded Hungarians who support NATO and its now more than ever critical mission. Exacerbating the effect of such public criticism is the U.S. silence toward some countries neighboring Hungary where the members of the Hungarian minority face various forms of discrimination and intolerance. This silence gives the appearance of a double standard. The cumulative effect of these perceptions could have the unintended and detrimental consequence of undermining U.S. strategic interests in the region. Indeed, good bilateral relations between the United States and Hungary and a strong and united NATO are in the interest of both countries and necessary to meet the formidable challenges posed by Russia, terrorism and other crises. Winning Hungarian public opinion, instead of alienating it with gratuitous remarks about internal matters, is critical to the advancement of key American goals. As we criticize, we believe it is important to step back and place today’s Hungary into the context of that country’s recent history, a context too often ignored. While some of the practices raised may not completely mirror U.S. ones or need to be addressed, they are a far cry from the harsh realities of 40 years of Soviet-imposed rule that still has a lingering and deleterious effect on a nation that is striving to overcome that history – a history which was not of its making and which it was left to confront by itself at great sacrifice, as in 1956. It also appears that the timing of your remarks may have been premature. Some believe that the Parliament was going to consider enacting legislation that would have addressed some of the concerns you and your predecessors have previously raised. Such proposals unfortunately are sure to be dead on arrival in light of the Corvinus address. The key question that we respectfully suggest warrants re-examination and introspection is whether there might be better means of communicating U.S. concerns than such constant public criticism that haven’t yielded very much in terms of concrete results while carrying the very real danger of alienating friends? For example, wouldn’t the restoration of a vibrant independent United States Information Agency more effectively serve U.S. goals and interests, including the promotion of democracy and democratic institutions, than what appears to many to be unwarranted and unproductive lecturing? Thank you for considering our views, which we offer in a spirit of respect and constructive dialogue. We look forward to continue working with you in the interest of strengthening U.S-Hungarian relations and the foundations of those relations. 11/14/14 - AHF meets with National Security Council and State Department Officials - On Friday, November 14, 2014, Frank Koszorus, Jr., President of the American Hungarian Federation, and Paul Kamenar and Imre Nemeth, members of the Federation's International Relations Committee, met with Nathaniel Dean, Director for Central and North European Affairs at the National Security Council, Thomas O. Melia, Deputy Assistant Secretary of State, and Ivan Weinstein, Desk Officer for Hungary at the Department of State. 10/10/14 - AHF submits letter to President Obama: "...although we believe that vigilance is necessary to preclude backsliding when it comes to democracy, we are justifiably puzzled and deeply concerned that you lumped Hungary in with Egypt and some of the worst dictatorships of the world in assessing the state of civil society freedoms. We... respectfully call upon you to retract that part of your statement that unjustifiably places Hungary in the same category with Egypt and other such repressive countries. Doing so would help alleviate the concern, confusion and disbelief found in our community about the United States views of Hungary, a democratic ally. It would also serve to advance the goals of the United States in the region." 1/11/2013 - AHF again responds to Senator Ben Cardin, Co-Chair of the US Helsinki Commission. In his December 20, 2012 statement, the Senator was unfairly critical of Hungary. "...we are concerned that (1) your assertions concerning Hungary omit relevant facts; and (2) your statement fails to raise the discrimination and intolerant policies toward ethnic Hungarians in some of the countries bordering Hungary. The statement therefore leaves the impression... of bias, which could result in cynicism toward the Helsinki Commission and its valuable and necessary work." 2/17/2012 - AHF briefs top professional staff advisor to Chairman of the House Subcommittee on Europe and Eurasia on the eve of congressional delegation (CODEL) trip to Hungary and Slovakia. The Federation submitted a letter to the Chairman and Ranking Member along with significant background materials on Hungary andSlovakia and called their attention to recent harsh and often politically motivated and unfair criticism of Hungary and the anti-Hungarian attitudes, policies and practices in Slovakia [read more] and join the discussion on Politics.hu! Miért támadja Magyarországot az amerikai szenátor?